In undergrad, I felt like my school and internship were training me to be two different types of researcher. At USC, I was majoring in Environmental Studies with an emphasis in Biology. It was essentially two majors in one, with a year of biology, a year of chemistry, a year of organic chem, a year of physics, molecular biology, biochemistry, etc. On top of that, I took courses on international environmental policy and went to Belize to study Mayan environmental history. Meanwhile, I was working at Jet Propulsion Laboratory in Pasadena researching trends in historical rainfall data. I loved both sides of my studies, but felt like neither was exactly hitting the spot of what I would want to spend my career researching. I love marine biology but am not particularly interested in working constantly in the lab, looking for expression of heat shock protein related genes or pouring stuff from one tube into another. On the other hand, I was fascinated by the process of untangling the complex history of rainfall in California, but I yearned to relate this environmental history to the reaction of ecological communities, which was outside the scope of the project. During my gap year post-USC, I thought long and hard about how I could reconcile these disparate interests. I read a lot, and researched a bunch of competing specialized sub-fields. I realized that paleobiology fit the bill for my interests extremely well. Paleobiologists are considered earth scientists because they take a macro view of the earth as a system through both time and space. They have to understand environmental history to be able to explain the occurrences of organisms over geologic time. I really liked the idea of being able to place modern-day changes in their geologic context. What changes are humans making that are truly unprecedented in the history of life on earth? But it doesn’t have to be all zoomed out to million-year processes. A growing sub-field known as Conservation Paleobiology (CPB) is focused on quantifying and providing context of how communities operated before humans were around and before the agricultural and industrial revolutions, in order to understand the feasibility of restoration for these communities in this Anthropocene world. Sometimes, this means creating a baseline of environmental health: how did oysters grow and build their reefs before they were harvested and human pollution altered the chemistry of their habitats? I’m personally researching whether giant clams grow faster in the past , or are they reacting in unexpected ways to human pollution? It appears that at least in the Gulf of Aqaba, they may be growing faster in the present day. Such difficult and counterintuitive answers are common in this field. Sometimes, CPB requires thinking beyond the idea of baselines entirely. We are realizing that ecosystems sometimes have no “delicate balance” as described by some in the environmental community. While ecosystems can be fragile and vulnerable to human influence, their “natural” state is one of change. The question is whether human influence paves over that prior ecological variability and leads to a state change in the normal succession of ecosystems, particularly if those natural ecosystems provide services that are important to human well-being. In a way, the application of paleobiology to conservation requires a system of values. It always sounds great to call for restoring an ecosystem to its prior state before humans. But if that restoration would require even more human intervention than the environmental harms which caused the original damage, is it worth it? These are the kinds of tricky questions I think are necessary to ask, and which conservation paleobiology is uniquely suited to answer. At the Annual Geological Society of America meeting in Seattle this year, the Paleo Society held the first-ever Conservation Paleobiology session. The room was standing room only the whole time, investigating fossil and modern ecosystems from many possible angles. This field is brand new, and the principles behind it are still being set down, which is very exciting. It’s great to be involved with a field that is fresh, interdisciplinary, and growing rapidly. I look forward to sharing what my research and others find in the future. Like all organisms, bivalves have a limited budget governing all aspects of their metabolism. If they put more energy into feeding (filtering the water), they can bring in a bit more food and therefore fuel more growth, but sucking in water takes energy as well, particularly if there isn’t enough food to be filtered out. Bivalves also periodically have to grow gonadal material and eggs for reproduction, expand their body tissue (somatic growth) and of course, grow their shells (made of of a mineral called carbonate). All of these expenditures are items in a budget determined by the amount of energy the bivalve can bring in, as well as how efficiently they can digest and metabolize that energy. If a bivalve is placed under stress, their scope for growth (the max amount of size increase per unit time) will be decreased. Because they’re cold-blooded, bivalves are limited by the temperature of their environment. If temperatures are low, they simply can’t sustain the chemical reactions required for life at the same rate that endotherms like us can. They also may have to shut their shells and stop feeding if they’re exposed by the tide, or are tossed around by a violent storm, or attacked by predators or toxins from the algae that they feed on. When their budget is lower, they have to make painful cuts, much like a company lays off employees if their revenues are lower. The question is which biological processes get cut, and when? My first chapter (submitted and in review) has settled temperature being the primary control on seasonal shell growth. Bivalves at high latitudes undergo annual winter shutdowns in growth, which create the growth bands I use to figure out their age, growth rate, etc. We’d be a lot closer to accurately predicting when bivalves suffer from “growth shutdowns” if we had hard numbers on how much energy they actually invest in their shells. A new study from a team led by Sue-Ann Watson of James Cook University attempts to do just that. Collecting a database of widths for the annual growth rings of bivalve and gastropod (snail) species from many latitudes, Watson and her team were able to get a global view of how fast different molluscs grow from the equator to the poles. Because the unit cost of creating carbonate is determined by well-understood chemistry, they were able to create an equation which would determine the exact number of Joules of energy used for every bivalve to grow their shells. They still needed a total energy budget for each species, in order to the percent of the energy budget that each bivalve was investing in their shells. They drew on a previous paper which had calculated the standard metabolic rates for each species by carefully measuring their oxygen consumption. We could do the same for you if you sat in a sealed box for an extended period of time while we measured the exact amount of oxygen going in and CO2 going out. Dividing the amount of energy needed to grow the shell by the total amount of energy used in the organism’s metabolism would give us a percent of total energy that the bivalve dedicates to adding growth layers to its shell. That number is…not very large. None of the bivalves or gastropods they looked at put more than 10% of their energy into shell growth, and bivalves were the lowest, with less than 4% of their energy going into their shell. Low-latitude (more equatorward) bivalves have the easiest time, putting less than 1% of their energy into growth but getting way more payoff for that small expenditure. High-latitude polar bivalves have to work harder, because the lower temperatures they experience mean the reactions needed to create their shells are more expensive. In addition, most of that energy is going into the protein-based “scaffolding” that is used to make the shell, rather than the crystals of carbonate themselves. Organisms right now don’t have to put a whole lot of effort into making their protective shells, which could explain why so many organisms use shells for protection. That is good, because if shells were already breaking the bank when it came to the bivalves’ growth budget, they wouldn’t have a lot of room to invest more energy in the face of climate change. Unfortunately, as the authors note, these budgets may need to change in the face of climate change, particularly for bivalves at the poles. As the oceans grow more acidic due to human CO2 emissions, growing their shells will start to take up more of their energy, which is currently not a major part of their budget. 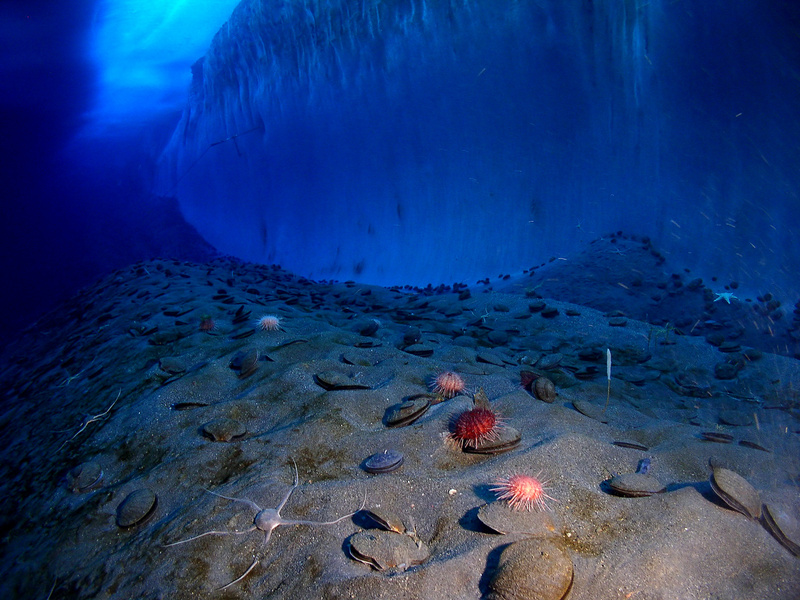 Right now, the cold waters of the poles are refuges for organisms that don’t deal well with shell crushing predators. As polar regions warm, such predators will begin to colonize these unfamiliar waters. Polar bivalves may encounter the double whammy of needing to spend more energy to make the same amount of shell, but also find that it is no longer enough to protect them from predators that easily crack open their protective coverings. I found this study to be an elegant and thoughtful attempt to fill in a gap in our current understanding of how organisms grow and how energy budgets are influenced by environmental variables like temperature. I instantly downloaded the paper because it answered a question that has long been on my mind. Maybe can sneak its way into my manuscript during the review process! I had taken a break from logging into Facebook/Twitter/Reddit for the last couple months because it was stressing me out. I was feeling inundated by political news that were making me feel overwhelmed and not in control of the information I was processing. So I disconnected for a while and my mind began to feel a lot clearer. The battery life on my phone also improved by at least 3x. I realized that while I appreciate and respect the views of the people I follow, as a collective the news they were sharing was crowding out my own personal views on the issues. I seriously felt like I was being radicalized after being subjected to a firehose of competing political opinions. I was worried I was contributing to that problem and doing the same thing to other people. But I like using Facebook and Twitter to keep in touch with my family, friends and colleagues. It is valuable to me to see pictures of your pets, news about whether you’re safe from the latest natural disaster, and links to your latest paper that’s headed straight to my references folder. So I’m back on FB/Twitter for those things, but I’ve set some strict rules for myself. Only can log in on my computer. The phone makes it too easy and compulsive to log in frequently and scroll through. And I have to log out immediately after viewing, with only one login per day permitted. No more than one post per day on any of the networks. No more than one political post per month. No replies to anyone that I don’t personally know. No Reddit. I actually haven’t missed that one at all. I hope I can find a way to engage and stay in touch with you all while not crowding out real life! Talk to you soon.